What do road repair people do? Is there only 10 of them in the entire city? How much work do they actually do in a day? I’m starting to really wonder what the answers to those questions are. Around 7-8 weeks ago, the street connected to ours underwent some surgery. The road repair crews dug up a section of 30 feet by 100 feet in a couple of days. Nothing too deep, they just removed part of the asphalt, around 2 inches in depth. Since the digging was completed very little has been done, but not for lack of repair crews being around. 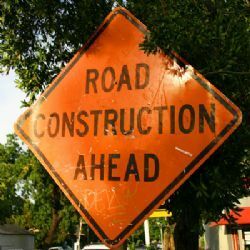 Two or three times a week they are out there, about five or six road construction workers, along with a couple of dump trucks and other repair equipment. They are there when we leave the house in the morning and they are still there when we get home from work. Yet looking at the street we see little to no difference compared to eight or nine hours earlier. Based on the current rate of actual work being done, I’m guessing the street will be back to normal sometime in 2013. What the heck are these guys doing all day and why is it taking so long?. These workers are doing nothing but reinforcing the stereotype of city workers being extremely slow and inefficient. I would probably get a pink slip from my employer if I would be even 1/10th as slow performing as these guys appear to be. If they can replace a complete bridge over a busy highway in a couple of days, I cant understand why it would take this long to patch 100 feet worth of residential street. I’ll take a few pictures tonight to show how little the area actually is, and how little work has been done in around 2 months’ time. Here are the pictures showing our municipal tax dollars hard at work!